I started this post yesterday but left before I can complete it. Now, its almost 24 hours later - how time flies! 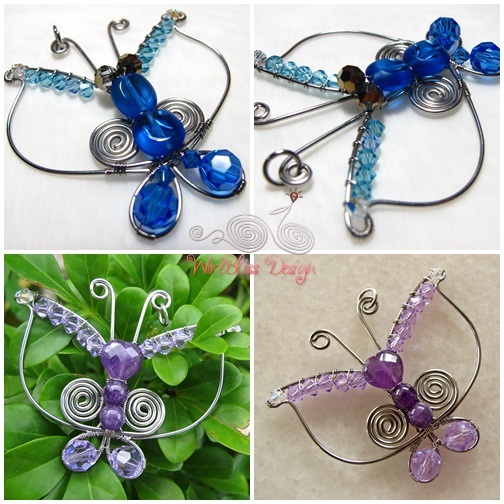 Two butterflies and two flower pendants. Here's some facts about butterflies. Butterflies only sip liquid food. These can be nectar from flowers, liquid from rotting fruits and.....(not so nice) also rotting animal flesh or animal fluids (yucky!). Sipping is done using a tube-like proboscis. This is their 'tongue' and it is long and flexible. When not in use, this 'tongue' coils up into a spiral (mmm..love spiral). These pendants were shipped out yesterday and I hope the new owner will love them. Labels: Necklaces | Pendants , Wire Jewelry Share it! Yes, it's official... your butterflies are SO cute! I think, I should try the wire bees as well. Heather, great to hear from you and happy to be able to inspire. I usually don't post in Blogs but your blog forced me to, awesome work,stunning!